Looking to enhance your home's decor? 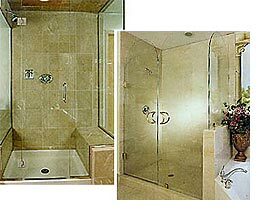 Frameless shower enclosures by Georgia Home and Commercial Products. Georgia Home and Commercial Products makes luxury baths affordable. 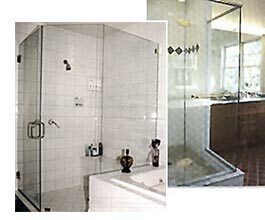 Today's shower enclosures offer more options for the bath than ever before. The shower is often the most prominent element in the bath; it makes a statement. Use enclosures as the foundation of the entire design. Boost the shower enclosure to new heights. Georgia Home and Commercial Products can design the enclosure with the use of clear glass to unusual glass finishes and textured designs. 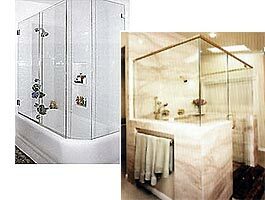 Glass enclosures enhance tile, marble or other solid surface finishes, while giving the space a more open appearance. Heavy glass 3/8 inch or 1/2 inch in thickness provides a luxurious, tangible feel. The frameless bath enclosure system minimizes the amount of metal used to hold the panel doors in place. Providing a spacious feel, the frameless shower is a popular design element which can be used to set the tone in many baths. You can choose from a broader palette of colors and finishes for framework and hardware accessories. Homeowners are able to create looks which complement faucets, door handles and the trim around their mirrors. One of the newest options, brushed nickel, has a dramatic, sophisticated look and is an enduring trend. It works well with granite, stone, solid surface or tile for a natural or retro design, while offering an exciting look with chrome accents. It's easy to maintain and is versatile, with soft, muted tones that help hide water spots and scratches, while complementing other accessories. Make a bold statement with color. Powder coatings offer a bold surface coating in nontraditional and custom matched hues. You and Georgia Home and Commercial Products can transform your shower into luxurious sanctuaries. The modern enclosure is designed to accommodate the latest accessories, offering variation in height and width, frameless corners with mitered glass edges, and overhead transom panels. Georgia Home and Commercial Products can give you an exciting visual impact. We can accommodate openings of all shapes and sizes, luxurious quality by you and Georgia Home and Commercial Products.